Dry skin can often be very difficult to deal with, and many people spend hundreds and hundreds of pounds on trying to find suitable products- with little or no success. One of the mistakes that many people with dry skin make is to opt for overly heavy products that don’t absorb into the skin well. This could lead to very greasy looking skin and blocked pores- which could result in spots. Specially tailored products need to be used on dry skin in order to keep dryness under control and get skin looking its very best. A long lasting moisturiser which can keep skin hydrated day and night without promoting excess oil is key, and will help skin to look soft and supple. 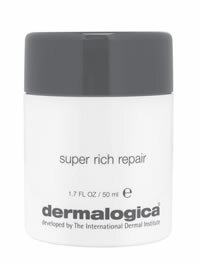 Dermalogica Super Rich Repair is fantastic for intensely hydrating very dry and dehydrated skin without leaving any sticky or greasy residue. Super Rich Repair is suitable for both day and night use, and its ability to stimulate the production of collagen means that visible signs of ageing are also tackled. Dermalogica Super Rich Repair is the perfect way to quench the thirst of dry skin- without leaving it looking and feeling like an oil slick!